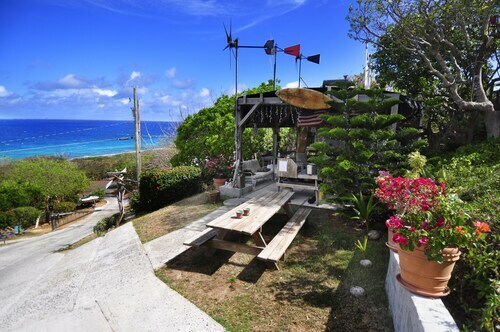 Situated near the beach, this hotel is within a 15-minute walk of Estate Hassel Island and Blackbeard's Castle. Magic Ice Gallery and Virgin Islands Legislature Building are also within 10 minutes. 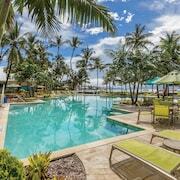 Nestled on the beach, this St. Thomas hotel is within a 10-minute walk of Coki Beach and Coral World Ocean Park. 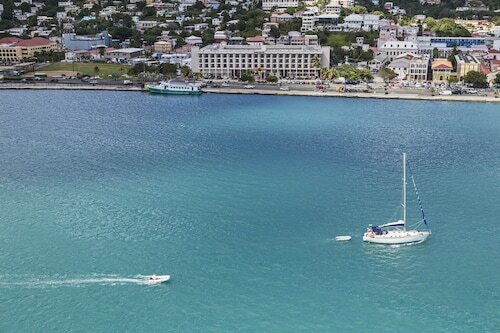 Sapphire Beach and American Yacht Harbor are also within 3 mi (5 km). Situated in the historical district, this hotel is steps from Beracha Veshalom Vegimulth Hasidim Synagogue and Blackbeard's Castle. Magens Bay Park is 2.7 mi (4.3 km) away. 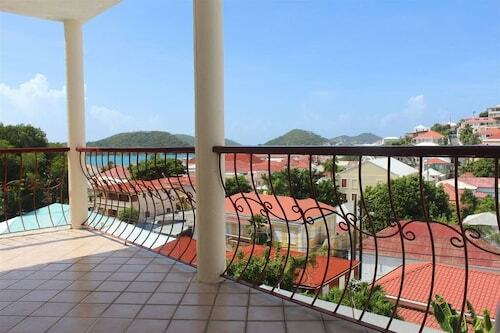 This beachfront resort on St. Thomas is located along a curving bay, a 5-minute drive from the airport and short distance from Charlotte Amalie, brimming with duty-free shops. Located in the heart of St. Thomas, this bed & breakfast is within a 5-minute walk of Frederick Lutheran Church and Blackbeard's Castle. Magens Bay Park is 2.7 mi (4.4 km) away. 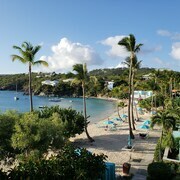 Secluded on the island's easternmost point, facing turquoise Great Bay and St. John, this St. Thomas resort features a beach and freeform pools with Caribbean Sea views. Located 50 miles east of Puerto Rico, St. Thomas sits adjacent to scenic St. John, which can be seen from the vistas of the Resort. 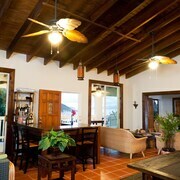 Situated near the beach, this luxury villa is 1.2 mi (1.9 km) from Drake Seat and within 3 mi (5 km) of Blackbeard's Castle and Magens Bay Park. Market Square East and Lionel Roberts Stadium are also within 3 mi (5 km). 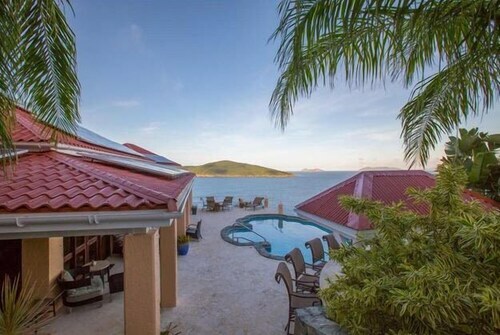 Situated near the beach, this luxury villa is 2.3 mi (3.7 km) from Magens Bay Park and within 6 mi (10 km) of Blackbeard's Castle and Mahogany Run Golf Course. Drake Seat and Lionel Roberts Stadium are also within 6 mi (10 km). 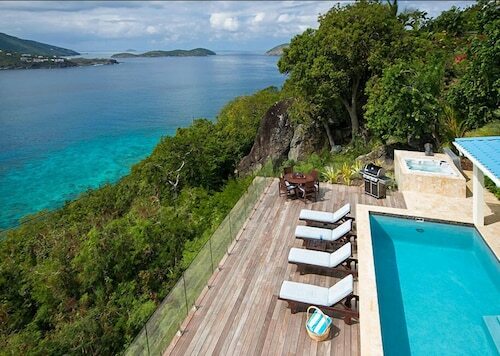 Situated in St. Thomas, this luxury villa is within 3 mi (5 km) of Magens Bay Park, Mahogany Run Golf Course, and Drake Seat. Blackbeard's Castle and Coki Beach are also within 6 mi (10 km). 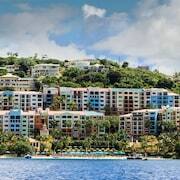 How Much is a Hotel Room in St. Thomas? 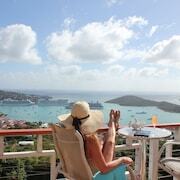 Hotels in St. Thomas start at $64 per night. Prices and availability subject to change. Additional terms may apply. Although this island owes its name to an apostle known for his doubts, there’s no reason for you to be uncertain about booking a trip to St. Thomas. With pristine beaches, Caribbean delicacies, and abundant sea life, this idyllic island can be paradise for couples, families, business travelers, or anyone in search of an exotic escape. Magens Bay Beach is a must-see, while Frenchtown, near Cay Bay to the south, offers European cuisine so authentic, you’d swear it was prepared in Paris. Sample some of the Caribbean’s finest seafood in the island’s East End, where rhythms from steel drums fill the air, and sea turtles welcome you to join them in the waves. And if you’re ready to let the waters of the Caribbean wash away your worries, count on Travelocity to help you find ideal St. Thomas hotels that fit neatly your budget. Aqua Terra: Feast on savory entrees with ingredients from both land and sea at the upscale Aqua Terra restaurant. Water fun: Morning Star Beach features a splash zone for kids, but you can cool off in one of four swimming pools, including a couple of the infinity-type. Health and wellness: Stay on top of your workout routine at the on-site fitness center. And when you’re ready to relax, treat yourself to some personalized pampering at Lazule Sea Spa. Event space: With ballrooms, dozens of meeting rooms, and 60,000 sq. ft. of event space, this one-of-a-kind property makes it possible to host corporate meetings, beachside weddings, and occasions of any size. Pools and spa services: In addition to a hot tub, traditional pool, and infinity-edge pool, the Ritz-Carlton invites guests to enjoy spa treatments in any of 11 rooms before unwinding in a seaside cabana. Dining and drinks: Enjoy views of local beaches, hills, and resorts from the hotel’s terracotta-roofed Grand Palazzo Club, or dine at any of the Ritz-Carlton’s four other oceanfront eateries. 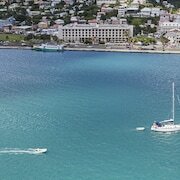 Event space: Interested in hosting an event in St. Thomas? This resort has more than 10,000 sq. 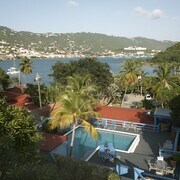 ft. of indoor and outdoor event space offering breathtaking views of the Great Bay and neighboring St. John. Water sports: Aquatic adventurers can engage in a number of nonmotorized water activities, or board a sunset cruise or chartered ride aboard Lady Lynsey, the Ritz-Carlton’s luxurious catamaran. Sunset Grille: Offering inventive cocktails and an impressive selection of wines alongside American steakhouse-style entrees seasoned with Caribbean flare. The open-air dining room provides an incredible view only matched by the service and romantic beachside dinners, replete with Tiki torches and rose petals (available upon request). Cruzan Beach Club: A cozy, tiki-themed bar that blends Caribbean cuisine with flavors from the American Southwest. Sip on unique tropical cocktails on the outdoor patio, or request bottle service from the secluded VIP cabanas. Groceries: By taking advantage of Secret Harbour’s grocery provisioning service, you can spend more time enjoying your adventure, rather than wandering around the local food store. Marine sanctuary: The resort’s private cove is adjacent to a marine sanctuary, and aside from sunbathing, snorkeling, and swimming, there are a wealth of watersports for families and couples to take part in. 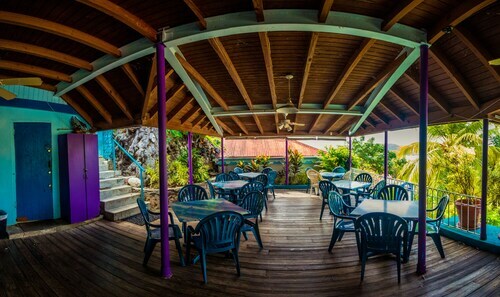 Food and drink: Enjoy a peaceful meal at Bolongo Bay’s Lobster Grille, or let your hair down at the resort’s more vibrant venue, Iggie’s Beach Bar &Grill. Surprise sips: Partake in the resort’s weekly snorkel booze hunt, where you get to wet your whistle with whatever you find. 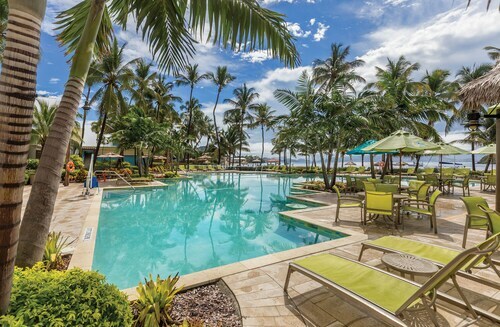 Outdoor activities and gym: Take a dip—or an introductory scuba lesson—in the freshwater pool that features swim-up bar, play beach volleyball with the resort’s available courts, or get your workout in at the on-site cardio room. Water sports: Hit the waves as long as you’d like thanks to unlimited free use of paddle boards, kayaks, and other nonmotorized vessels, or go for a cruise on Bolongo Bay’s award-winning catamaran, Heavenly Days. If you can’t wait another minute to book your trip to the Virgin Islands, count on Travelocity to help you score unbeatable deals on cheap hotels near St. Thomas at any time of year. 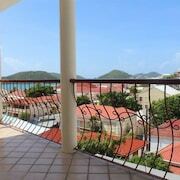 Our extensive selection of hotels in St. Thomas is the largest in the world, giving you the greatest number of options before deciding which St. Thomas lodging option is right for you. Make your choice today, and watch any doubts you have disappear upon arriving on this island. The all inclusive was great and so was the service. This property is basically in the middle of the island. It has many close restaurants and shops nearby. Very remote island with small number of residents. Eco friendly location. 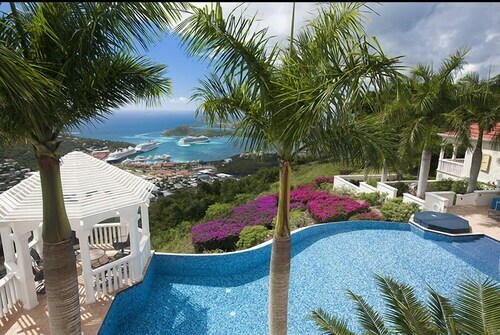 Perfect view of the ocean. Room was clean, linens were clean, placement of units is perfectly nestled on property with plenty of trees to shield other units. Property still struggling out of the hurricane but overall property was nice. Drinks and dinner were good. Pool and hot tub still on the repair list. the breakfast was good the pool was nice the staff was good. The views were magnificent from our very private balcony in villa A6. The décor and furnishings were very nice! It felt like a home away from home! 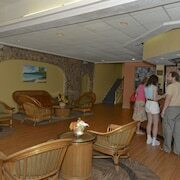 The staff were friendly and very accommodating. The fine dining restaurant at the resort was wonderful! Great food and staff! Minutes away from Cockie beach which was a lot of fun! There isn't anything my fiancé and I did not enjoy! The only down side was the amount of stair climbing we had to do; but since there was no fitness facility we used this as a form of exercise! Installing a fitness facility and a hot tub would make this resort almost impossible to match!! Can't wait to get back there! Thank you for a wonderful vacation experience!